Rievaulx Terrace sits on the hill above Rievaulx Abbey. Thomas Duncombe the Third, the owner of Duncombe Park, created this neo-classical garden in 1758. The National Trust owns the site and access is free for members, non-members must pay the entrance fee. If you are combining a visit here with a trip to Rievaulx Abbey, the two sites are only a short walk or car ride apart. The site allows Dogs as long as they are on a lead. The terrace closes during winter time. Rievaulx Terrace is easy to find, on a minor road, just off the B1257, two miles north-west of Helmsley (Post Code: YO62 5LJ). There is a walking route from Helmsley to Rievaulx, this is described in my post about Rievaulx Abbey. Once inside the grounds stroll through some woods which are alive with wild flowers and garlic in spring or autumn colour later in the year. This a lovely introduction before entering the terrace itself. As you leave the woods you’ll find yourself on a grass-covered terrace. There you’ll discover a classical Ionic Temple facing a Tuscan Temple at the other end, 700m away. Rich plasterwork decorates the walls and ceiling of the Temple. Thirteenth century tiles from nearby Byland Abbey cover the floor. It is not possible to go inside the temple, so this all has to be admired through the windows. 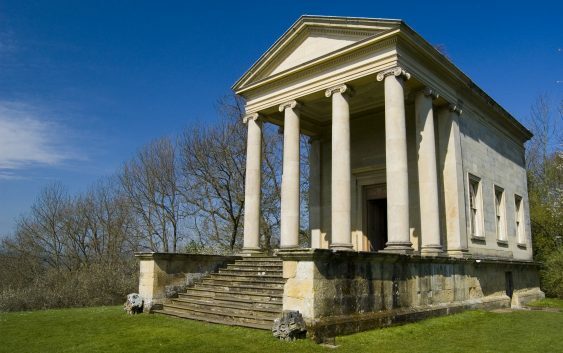 The Ionic Temple at the other end is where the Duncombe family and guests would eat after a walk along the Terrace. The lavish interior must have been an amazing sight to the privileged guests. Beautiful furniture and ceramics fill the room, with the main feature the intricate ceiling paintings. Beneath the Ionic Temple, there is an exhibition space to learn more about the Terrace and Temples. Strolling along the terrace between the two buildings you’ll notice that it is carefully crafted so that a different perspective opens up as you walk along. There are amazing bird’s eye views of the Rye Valley and the entire Rievaulx Abbey site.